The Grinch Funko Pop! Figure | Nerd Much? "You're a mean one, Mr. Grinch." Though there are a lot of great nerdy gifts out there, nothing quite kicks off the season of Christmas quite like The Grinch Funko Pop! Figure. Made in the design of the original illustrations in Dr. Seuss’ How The Grinch Stole Christmas, this figure is sure to remind you of the old 1966 cartoon. It airs every year and for some reason, never gets old. Probably because the second you hear Thurl Ravenscroft’s voice curling in your ear and saying “you’re a mean one, Mr. Grinch,” nostalgia hits. The man made it an unforgettable song and the original as done by Ravenscroft will always be the best one. The 1966 cartoon aside, The Grinch Funko Pop! Figure is depicted as he is when he begins to steal Christmas. He is dressed in the Santa suit he made and with a mischievous grin, carries a large roasted turkey. Or whatever the Whoville version might be called. 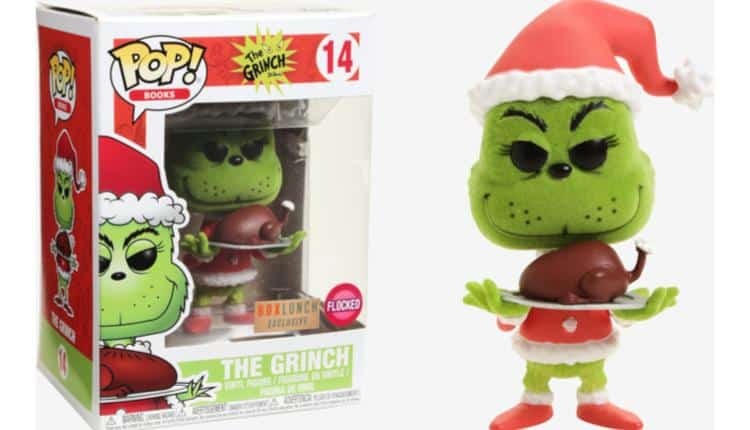 In order to better depict the Grinch’s usual furred appearance, Funko decided to make this one flocked. Though the fuzz does not perfectly line up with his eyebrows, nose, and eyes, it still looks perfectly fine from a distance. It really depends on how much of a stickler you are about such things. Personally, it would drive me nuts. But if it is sitting on a shelf, that’s far enough away from the details to not matter. This Grinch stand at the Funko Pop! figure usual height of 3.75 inches tall. He is made of vinyl of course, and priced at $14.90 USD. He is sure to set the Christmas spirit into high gear with his big heart. Nothing like the Grinch to remind us that it’s the people we’re with and what we do at Christmas that matters more than the decorations or presents. Carefully set on your tree or sitting on your mantel next to the stockings hung with care, The Grinch Funko Pop! Figure is sure to fit right in with any Christmas decor around the house.